Germany’s 2011 VDP Grosse Gewaechs – Grand Cru - white wines were released on September 1, 2012. These are the ultra-premium dry wines from the very best vineyard sites made by some of the best producers in Germany. 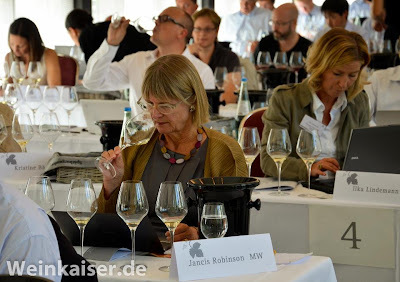 At this annual occasion, a number of presentations by the VDP – the association of German elite winemakers - take place all over Germany, including one in Berlin during the first days of September and then one later in the month at the historic Eberbach Abbey in the Rheingau. One presentation that clearly stands out is the pre-release tasting for a group of about 120 wine journalists, sommeliers, retailers, importers, etc from all over the world, but mainly from Germany, in the old Kurhaus in the stately German spa town of Wiesbaden, which is 45 minutes drive from Frankfurt. It is a seated, very well organized tasting where you have the chance to go through the VDP Grosses Gewaechs wines during 2 days. The invitations for this event are highly sought after. This year, I was happy to get invited by the VDP and to participate in the event. Others I saw at the event were Jancis Robinson from the Financial Times, US wine importer Rudi Wiest and Gault Millau WeinGuide Deutschland editor Joel B. Payne. 436 Grosse Gewächse wines from 157 VDP wine producers from 261 Grosse Lagen were poured. Notable absentees were Weingut Leitz, Weingut Breuer (as Weingut Breuer is no longer member of the VDP) and Weingut Peter Jakob Kuehn (Peter Jakob feels that late August is still too early to present his Grosse Gewaechs wines). What is a VDP Grosses Gewaechs wine? There is currently a bit of confusion (and there will be even more confusion in the years to come) as (1) Grosses Gewaechs was a term that was created by the VDP only a few years ago and (2) the VDP is still in the process of refining its classification concept. Although many people think that there is only one wine classification system in Germany – the classification system of the Law of 1971 – this is not correct. True, the classification system of the Law of 1971 is the standard classification system in Germany and the vast majority of winemakers in Germany use this approach. A large number of winemakers, however, have moved away from the standard, in particular the VDP producers. In a nutshell, the VDP is moving to a classification system that resembles very much the classification system in the Bourgogne. The classification of the VDP puts the terroir principle at the center of its classification approach. The pyramid of ripeness has been moved to the backburner and indeed for dry wines completely removed. With the latest modifications of earlier this year, the absolutely finest vineyards are called Grosse Lage (for the 2011 vintage still called Erste Lage) and dry wines from these super top vineyards are called Grosses Gewaechs. Grosses Gewächs wines are the finest dry wines from Germany’s finest vineyards. To qualify for the Grosses Gewaechs label, a number of criteria need to be respected. (i) The fruit has to come from a Grosse Lage (for the 2011 vintage still called Erste Lage) vineyard. (ii) At harvest, the grapes need to be at least at Spaetlese level in terms of the sugar content. (iii) Only certain – typical - grape varieties are allowed, including Riesling and Spaetburgunder. Riesling is the only varietal allowed for Erste Lage wines in the Mosel, Nahe, and Mittelrhein, but grapes like Spaetburgunder (Pinot Noir), Lemberger, Fruehburgunder, Weissburgunder (Pinot Blanc), Grauburgunder (Pinot Gris), Gewuerztraminer, and Silvaner are included in other regions. (iv) Further restrictions apply: there are yield restrictions; only hand picking of grapes is permitted and harvest must be late in the autumn. This is what we had in the glass in Wiesbaden: White Grosses Gewaechs wines from 2011 and red Grosses Gewaechs wines from mostly 2010, but alos some from 2009 (Spätburgunder (Pinot Noir) and other red Grosses Gewaechs wines age in barrique for at least 12 months and are thus released later). The VDP is the world’s oldest association of wine estates in the world. In fact, it is the only one of its kind worldwide. No other country has a national organization of the top wine makers of the entire country. Throughout the past century, the quality-driven goals and strict standards of the VDP have played no small part in shaping the viticultural and winemaking practices in Germany. With their stringent statutes and their establishment of a German vineyard classification, the 200 members of the VDP have served as role models and justifiably can be viewed as the vanguard of the nation’s producers of top-quality wines. The tasting list started with about 15 Silvaner from Franken – wines which I liked very much but which are difficult to find outside of Germany. The Moenchshof of Bickel-Stumpf was a reveleation, thick and creamy with lots of minerality. The Mosel-Saar-Ruwer Grosses Gewaechs wines came in 2 groups: (1) Here, at the beginning, wines within the dryness limits of the VDP and (2) then at the end again wines from a Grosse Lage vineyard, that were kind of dry, but slightly above the dryness limit. With regard to the first group, allthough I know that my fellow colleagues at the German Wine Society Board (Washington DC Chapter) all love the fruity sweet wines of Ernst Loosen, Dr. Loosen put on a strong performance with his ultra premium Grosses Gewaechs wines from Himmelreich, Wuerzgarten, Praelat, Sonnenuhr and Treppchen. I would also like to mention the impressive Marienburg collection of Clemens Busch, the non-conventional winemaker from Puenderich. 1 wine – Edelacker of Pawis, fruity and mineral. Kuenstler presented wines from Ruedesheim – Berg Rottland – and Hochheim – Hoelle and Kirchenstueck, and all 3 of them were in the top league. Kuenstler makes elegant and complex wines with depth and a long finish in the mouth. I was in particular impressed by the Hoelle. It is only recently that I am getting more familiar with the wines of Desiree Eser, Weingut August Eser, as the Eser wines have been practically absent from the export market so far. The Lenchen showed fruit and strength, with fine herbal notes. Another producer that sells predominatly on the domestic market is Weingut Jakob Jung. The Siegelsberg of Alexander Jung was steely, with a vibrant acidity. The Graefenberg of world class producer Robert Weil was a work of art, with a lot of depth and a never ending finish. An Ambassador of Rheingau Riesling. Schönhell of Barth - creamy, smooth, with a nice finish. Königin Victoriaberg of Joachim Flick – vibrant acidity, light herbal notes, long finish. There was a lot of talk about the wines of Balthasar Ress, which have been made for the past two years by wine blogger and wine maker Dirk Wuertz. All agreed that Dirk Wuertz is leading Weingut Balthasar Ress to unconventional and new hights. The Berg Schlossberg has lots of potential and should be put aside for the next 10 years. Overall, I have to say, the Nahe collection of Rieslings was a very impressive and consistent collection of the highest caliber. This was pretty much confirmed by other tasters during the breaks. US wine importer Rudi Wiest did not stop praysing the wines of Schaefer-Froehlich. Indeed, the Felsenberg, Felseneck and Halenberg representated a very strong collection. Kruger-Rumpf is generally viewed as a second tier top producer in the Nahe, but I must say, the Kapellenberg, Dautenpflaenzer and Pittersberg were wines with dense mineral notes and great pure fruit that were getting very close to what Doennhoff and Emrich-Schoenleber, the two Nahe stars, put on the table. Equally, the Pittermaennchen, Goldloch, Burgberg and Schlossberg collection of Schlossgut Diel were pure and focused with a great vibrant acidity and a long finish - aristocratic Rieslings. At the top, as always, there was a battle between Keller and Wittmann. But one should not forget that Keller’s collection did not include his super wine G-Max, a 100 points wine, nor did he present all his Grosses Gewaechs wines. For me, Wittmann was ahead with his Aulerde, Kirchenspiel, Brunnenhaeuschen and Morstein. Dirk Wuertz: “Wittmann has presented the collection of his life”. There is no need to introduce the wines of H.O. Spanier. Perhaps not yet so well known is the fact that he is responsible for the wines of both Battenfeld-Spanier (his estate) and for Kuehling Gillot (the estate of his wife Caroline Spanier Gillot). There was general agreement among the various tasters I talked to during the breaks that H.O. Spanier is closely behind Phillip Wittmann. I was in particular impressed by the Kuehling-Gillot Pettenthal. The Gunderloch Pettenthal also stood out – pure, mineral. 53 wines. In addition to the Rieslings, the Pfalz presented 13 Spaetburgunder and 9 Pinot Blanc wines. The flight that touched me most was to the flight #31 with 6 wines from the Pechstein in Forst from 6 different wine makers: Acham-Magin, Bassermann-Jordan, Dr. Bürklin-Wolf, Reichsrat von Buhl, Georg Mosbacher und von Winning. All wines came from the same terroir, but were made in different wine cellars. My favorite was the Reichsrat von Buhl. Overall, the Herrenberg and the Michaelsberg of Fitz-Ritter were my favorites from the Pfalz. A surprisingly large number of Rieslings from Franken. I liked the Julius-Echter-Berg and the Kronsberg from Hans Wirsching best. While the focus of the wines from Baden was red wines, Baden also presented 6 Riesling wines. The Herrenberg of Seeger was my favorite. Again, another German wine region that is not known for its Rieslings. I must admit I almost never drink Rieslings from Wuerttemberg. A dozen Riesling wines nevertheless. Ernst Dautel’s “Gruebenstein” Sonnenberg was my favorite. 1 wine (of Pawis) – mineral, with a long finish. Sonnenschein of Rebholz was my favorite: dense, with a long finish. The Schlossberg of Weingut des Grafen Neipperg stood out. My favorite: The Herrenberg of Seeger – dense, never ending finish. Again, the Herrenberg of Seeger my favorite. Knipers presented 3 wines: Mandelpfad, Kirschgarten and Burgweg – all a year older than most of the other red wines (2009). All ultra-premium wines. If I had to choose one, I would pick the Burgweg. Bernhard Huber put on a strong performance with his 4 wines: Bienenberg, Wildenstein, Schlossberg and Sommerhalde. The best wines came from Gerhard Aldinger, Schnaitman and Neipperg. All interesting wines. The Austrians a currently showing the world what the Lemberger variety (called Blaufraenkisch in Austria) can produce. Again, Graf Neipperg was my #1. As referred to above, these were wines that exceeded somewhat the limit for dryness and thus can not be sold as Grosses Gewaechs. 10 of these wines came from van Volxem and Heymann-Loewenstein. The remaining 3 came from Clemens Busch, Reinhold Haart and Forstmeister Geltz-Zilliken.